Douglas Sherbrooke, Earl of Northcliffe, is a man besieged. He must have an heir. Thus he must first provide himself with the requisite bride. Alexandra Chambers, youngest daughter of the Duke of Beresford, has loved Douglas Sherbrooke since she was fifteen. Unfortunately, it is her sister, the incomparable Melissande, he wishes to wed. But life never ladles out what one expects, and Douglas finds himself wed to the wrong sister. If having an unwanted wife isn’t enough, he is also plagued by The Virgin Bride, a ghost that is reputedly seen in the countess’s bedchamber. The Sherbrook Bride by Catherine Coulter is the first book in the Bride Trilogy. I haven’t read the other books in this series yet but I plan to as I rather enjoyed this one. It’s the story of Douglas Sherbrooke, Earl of Northcliffe, who needs a wife to sire an heir. He can’t be bothered to go to London for the season to find a suitable bride, but instead his choice falls upon Melissande, a beautiful girl from a noble but impoverished family he met a few years before. But when the marriage is about to be celebrated, Douglas has to go away on a secret mission for the government. So, he decides to send his cousin Tony to wed Melissande by proxy. But when he comes back, he’s shocked to find out that Tony has married Melissande for himself and wed his sister Alex by proxy to him. Douglas is understandably furious at this betrayal. But, instead than annulling the marriage or trying to get to know his wife better and making the most out of a bad situation, he just humiliates and ridicules poor Alex at any given opportunity. It’s not like he was in love with Melissande either. It’s just that his pride is hurt and he needs to take it out on someone. And when the marriage is finally consummated, he blames her for making him lose control in bed (something that never happened to him before). At first, I really didn’t like Douglas at all. He just behaves like a spoilt child and a jerk, but he gets better and a lot nicer once he has finally accepted Alex as his wife. Alex agreed to marry Douglas because she had been in love with him for years. She is a lovely girl and pretty, just not as much as Melissande and, because of this, has lived in her shadow all her life. She doesn’t consider herself to be anything special, is very meek and nice but also strong and stubborn. At first you just wanna slap he for putting up with Douglas and his horrible behaviour towards her, but then she comes round and decides she has had enough. The banter between her and Douglas at this point is quite funny. Alex is my favourite character in the book and the main reason why I enjoyed it. I liked that she’s not one of those independent and modern heroines you often come across in historical romances but she’s not overly-meek and is capable of standing up for herself and taking the initiative when needed. At the end of the book, we find out more details about Douglas’ secret mission, which didn’t end as well as he thought. A Frenchman with a grudge against the Earl will come back wanting revenge. Although this twist adds an element of surprise and suspence at the end, it didn’t add much to the book. The part that I really enjoyed was seeing Douglas and Alex getting closer and deciding to give their marriage a go. That was interesting enough for me without adding twists at the end. The ghost of the Virgin Bride didn’t do much either and I really didn’t see any need for it in the book. The book is well-written and overall, a very enjoyable read. 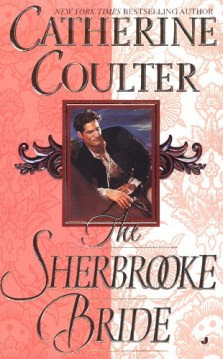 If you are a fan of historical romances, I think you will enjoy the Sherbrooke Bride by Catherine Coulter. The book is well-written and features a nice plot, a good dose of humour, intrigues and some twists at the end. The characters are interesting and three-dimensional. They are a bit annoying at the beginning but really come through as the book progress. The ghost is kinda pointless though. Available at: Amazon.com and Barnes & Noble.